Time sure flies. With the release of League of Angels II in April and many milestones achieved in the past 8 months, 2016 has been a great year for us. As the New Year arrives, we wish all LoA2 players a wonderful and productive 2017. League of Angels II has prepared a New Year bonus for all players from Dec. 31st, 2016 to Jan 1st, 2017. This time it’s available for players who login to the game through Gtarcade (loa2.gtarcade.com) and Facebook (apps.facebook.com/leagueofangelsii/). 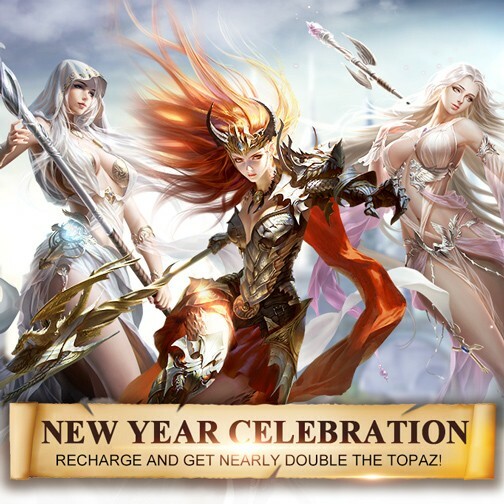 Recharge and Get Nearly Double the Topaz! To celebrate the New Year, we will have a limited-time special offer. Please note that event time varies per region due to time zone differences. Europe Severs: 16:00:01 Dec. 30th , 2016 to 15:59:59 Jan 1st, 2017, GMT. All players who recharge on Facebook and/or Gtarcade will get nearly double the Topaz immediately! For example, if you Recharge for 200 Topaz, you’ll get 399 Topaz ((200*2)-1)! The rule is, the total Topaz you get = (N*2)-1 (N being the original amount of Topaz you Recharge for). This means you will get almost double the Topaz that you pay for! If you missed out last Christmas special offer, then don’t miss this one! With this special Recharge offer, you’ll not only get more Diamonds, but also more free rewards. The bonus Topaz will also count towards in-game events, which means a lot of rewards and benefits can be gained at half cost. What's more, the extra Topaz will also count towards VIP growth. Therefore you can upgrade your VIP level for much less and unlock even more benefits! Hero Evolution is a brand new system in League of Angels II. This system enables Legendary Heroes to become Mythic and gain new skills, which mean they can be as powerful as Mythic Heroes! Legendary Heroes like Alecta, Theresa, and Aphrodite will have their chance to reclaim their dominant positions! Meanwhile, Mythic Heroes can be evolved too! Once Heroes are evolved, they’ll enter a brand new growth progression that replaces Augmenting and players will not have to sacrifice heroes to upgrade anymore. Amazing Hero Evo Pack and Mythic Hero Evo Pack will be available from in-game events on Dec. 31th. If you want to evolve your heroes, now is the best time with the Recharge Bonus! Click to learn more about Hero Evolution. During the event period, Angel’s Fund (Dec. 30th), the Lucky Tree and Charm Ranking events will also be online. All kinds of items and resources will be available from these events. What’s more, this time Angels’ Fund will refund Topaz rather than Diamonds. With the Recharge Bonus event, you can get way more Free Topaz and rewards than ever! Don’t miss the last event of 2016, it’s going to be huge! Happy New Year to all and we hope everyone will enjoy League of Angels II’s New Year special events and offers! See you in 2017!